Dimensions (HxWxD): 21"x 20"x 37.5"
The Swingline stack and shred 750X auto feed shredder is a high capacity shredder that automatically shreds 750 sheets of paper in approximately 15 minutes. It provides level 3 (P-4) moderate security and requires minimum maintenance due to the Intelligent SelfOil (16 oz. reservoir) and Intelligent Self cleaning cutters. Moreover, the Swingline 750X shredder also features an Intellegent Auto+Jam Clearance that eliminates paper jams and delivers uninterrupted shredding. The shredder reverses the stuck papers and re-feeds them to the shredder. 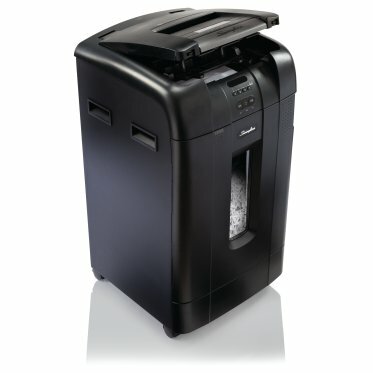 The 750X auto feed shredder also takes care of small shred jobs by shredding 10 sheets of paper manually including glossy and crumpled ones. Credit cards can also be shredded manually. However, the Swingline 750X shredder has a separate slot for shredding Cd’s and DVD’s. Owing to the shredders lockable chamber that requires a programmable 4-digit PIN code, the user can restrict the access to shredding papers during the process for the safety of the documents. In addition, the sheets are shredded into a large 31-gallon bin. With just a quick glance the user can see from the view window when the bin is full. However, there is also a bin full indicator that tells when the bin needs to be emptied. The Swingline stack and shred 750X auto feed shredder offers continuous operation and is ultra quiet during shredding process. It meets the shredding needs of 10 people easily and will keep up with the office high volume shredding demands. Shred up to 750 legal and letter size sheets automatically and 12 sheets manually in one cycle.